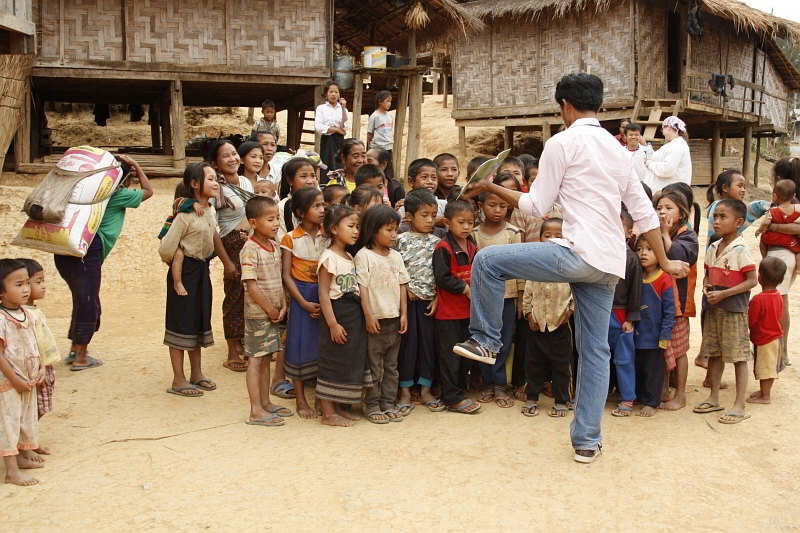 Imagine you're a child in a small village in Laos and your school loses its only teacher, so you don't go to school anymore. Imagine you have only ever read a textbook or seen writing on a blackboard. Imagine you've never owned a book so you don't know that you'll find more story if you turn the page. Now imagine...know... that this can change. 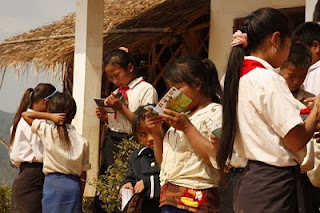 Big Brother Mouse, a young Lao-owned and Lao-staffed publishing venture, is now making creative books available in Laos, one of Southeast Asia's poorest and least developed countries. 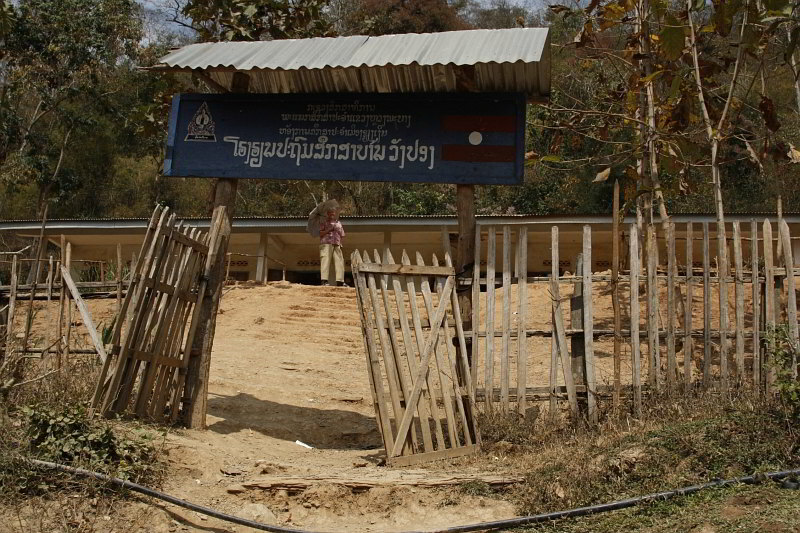 It publishes books in the Lao language (the language of schooling, but not the language of families in thousands of Lao villages). 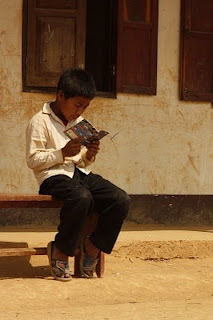 It also publishes bilingual books to help young people who want to learn English. Young readers gobbling up their new books. Big Brother Mouse is fostering a love of reading by making fun and educational books -- filled with fantastic drawings, paintings and photographs -- available to young readers of all ages. And now it's publishing more and more educational books for older readers too: books on women's health, taking care of your baby, inventions of the world, to name a few. Because rural families can't afford to buy books for their children, Big Brother Mouse gives its books to kids for free. Printing and distribution are made possible by donors, including individuals, businesses and foundations. TAMMACHAT Natural Textiles is happy to be one of these. 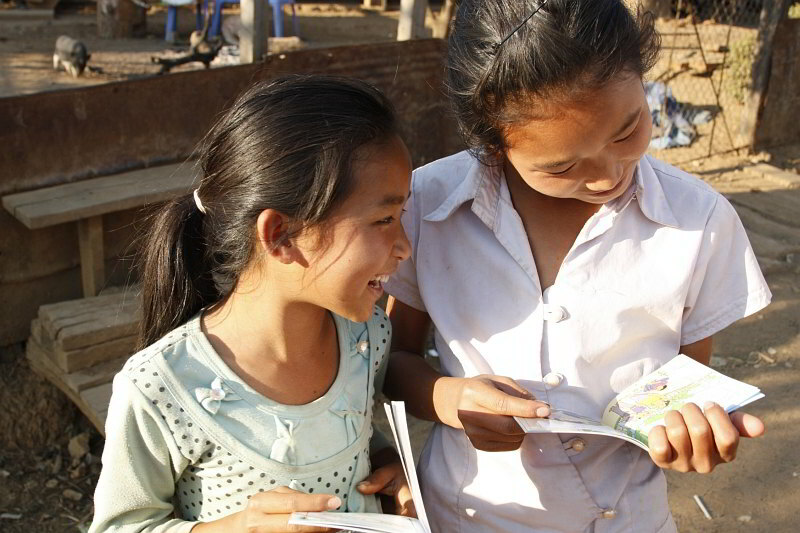 For every textile you buy, we give a child in Laos their very first book, published by Big Brother Mouse. This is especially important to us because it gives girls -- who can't attend monastery schools in the larger towns in Laos -- a leg up on their education. In February, we had the chance to travel with a 10-person book party team from Big Brother Mouse from Luang Prabang to Phonsavan, along with 9 donors/supporters/volunteers from Canada, Australia and the US. 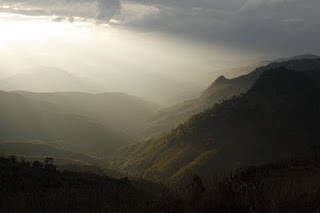 It was a cycling trip too -- we shared 7 bikes among 17 people, swapping off as we cycled up, up, up, down, down, down through spectacular mountainous countryside along one of northeast Laos's better roads. This photo essay gives a glimpse into our week with Big Brother Mouse. Fun? You bet! 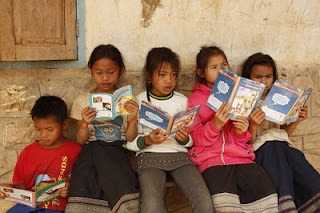 And we were very happy to help get more books into kids' hands. The views were spectacular but the roads to small villages are few. 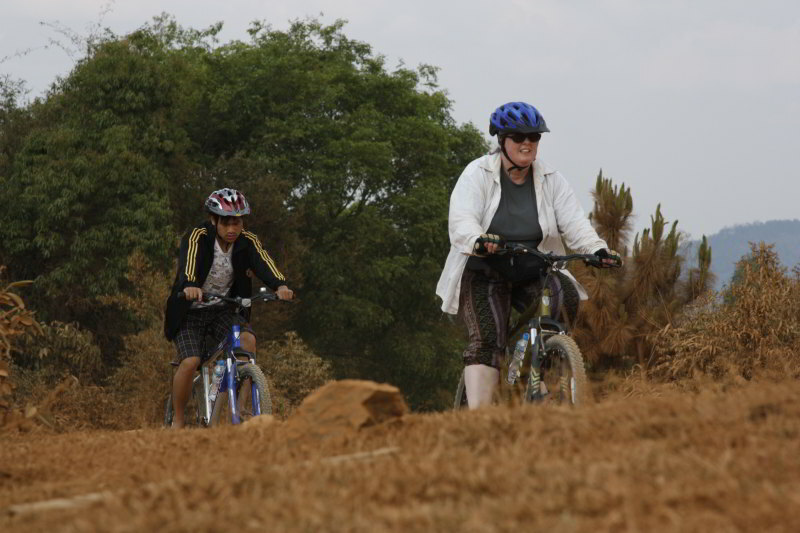 Noh, book designer, encourages volunteer and author Jane as they ride on a rough, dusty road. 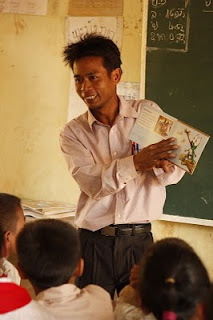 Much more than just a cycling tour, this trip was a chance for Big Brother Mouse to hold book parties in schools along the way and to hold spontaneous "read alouds" in small villages en route. Touy, driver and book party staff, tells a story from one of the books with great animation at a "read aloud" in a small village on the main road. Showing the pictures, telling the story...each child was given her or his own book after this reading. 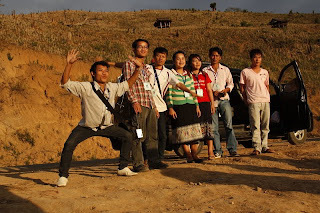 Sypai (writer and book party leader), Vanneled (writer) and Kongsy (photographer) were also researching and photographing any and every thing that tells the story of life in this part of Laos for future books. 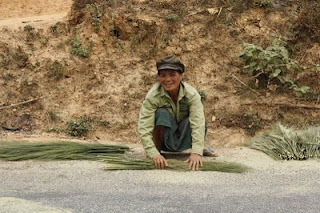 Villagers gathering and preparing grasses to make brooms. A blacksmith fashioning tools from scrap metal. 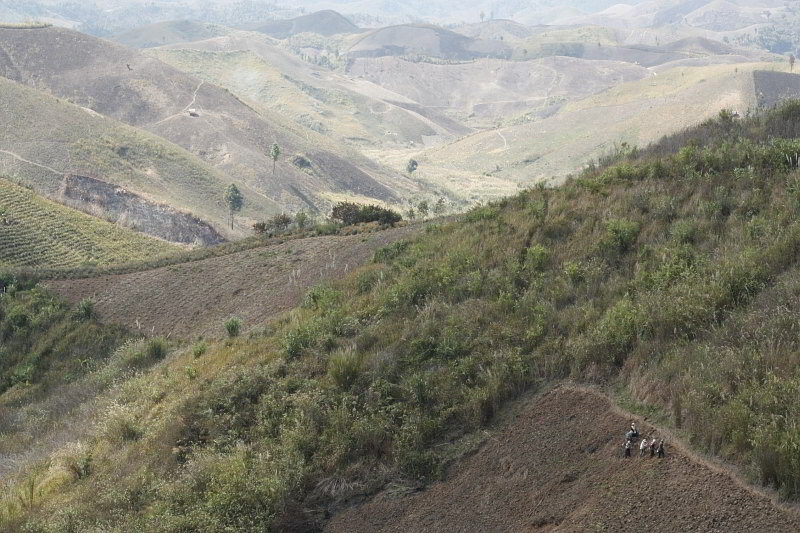 Rice fields grown up around bomb craters, a legacy of America's bombing of Laos in the '60s and '70s. 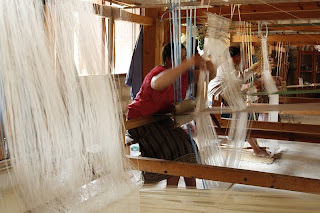 Weavers creating silk yarns coloured with natural dyes and weaving them into stunning silk scarves. 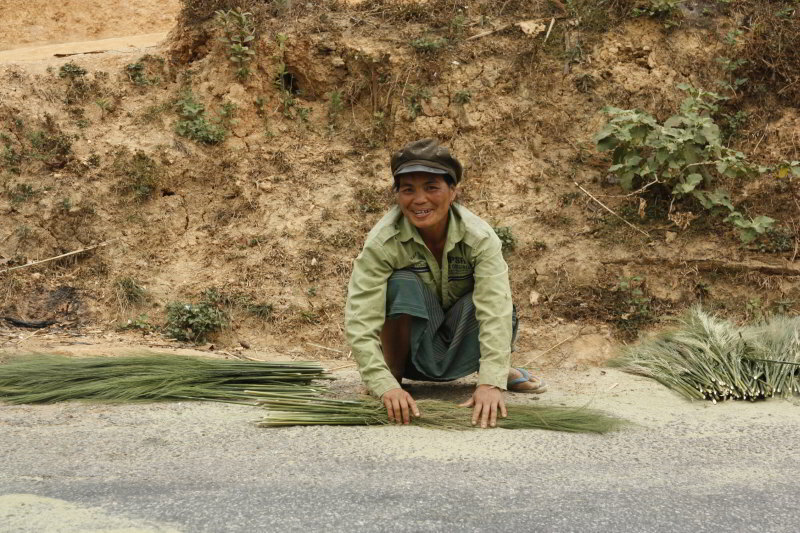 A woman preparing wild grasses to sell for broom making. We learn more about weaving at Lao Sericulture's farm. 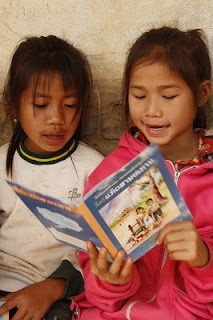 We had sponsored and attended 2 book parties in the past, and this year, we donated 794 books to schools in Luang Prabang province through 4 book parties, thanks to sales of TAMMACHAT's textiles in 2011. Learn more at http://www.bigbrothermouse.com/. 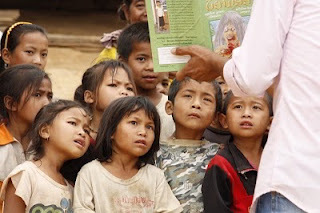 Donate directly, sponsor a book party yourself or the printing of a new book. Buy handwoven textiles from TAMMACHAT Natural Textiles. All are ways you can support this important work. A few of the many young Big Brother Mouse staff ham it up along the route. 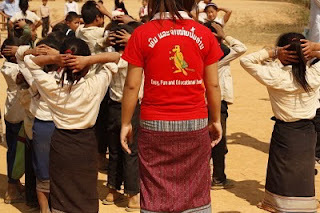 Four Big Brother Mouse book party teams visit 2 schools a day in rural Laos, bringing books to kids. 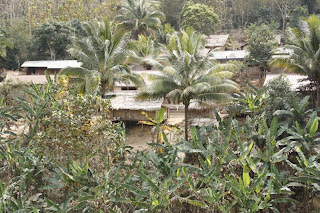 This is the first village in Xieng Khuang province where we stopped to hold a book party. 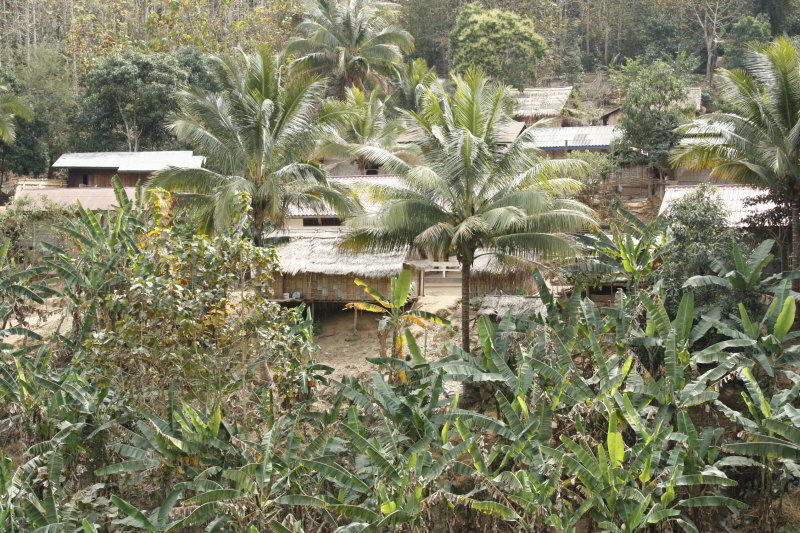 The village school sits up the hill from the river. A teacher reads aloud from the book about the frog -- he's never full! 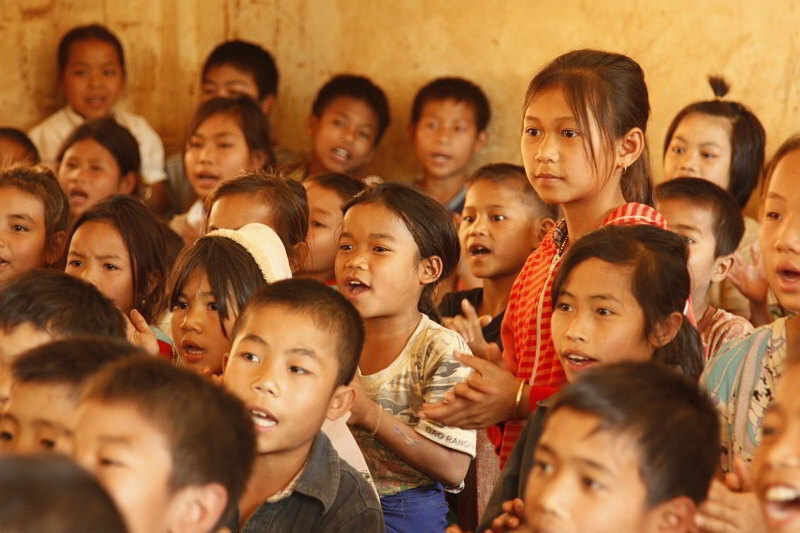 Children respond to a book reading, designed to engage young minds and show that reading can be fun. 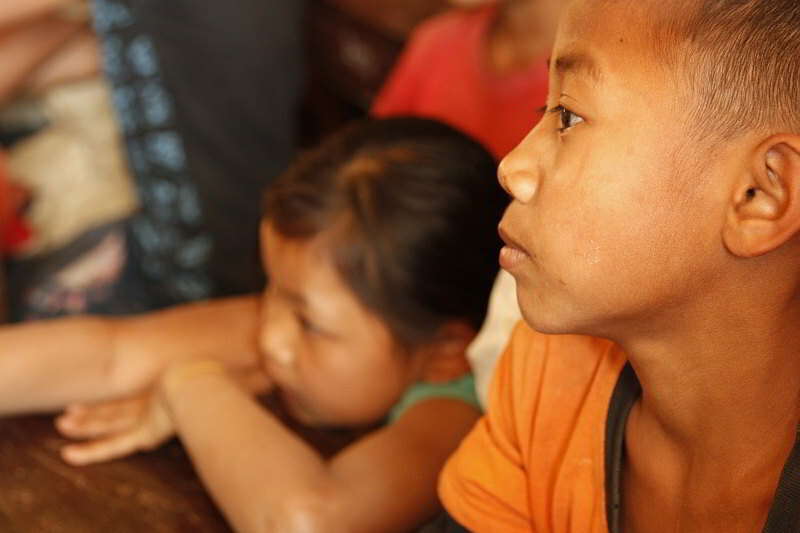 A boy listens to a story with rapt attention. Video: Sypai sings the Big Brother Mouse song that kids learn at the book parties -- all about the fun of reading! Games are part of the fun at Big Brother Mouse book parties. Listen, do, laugh. 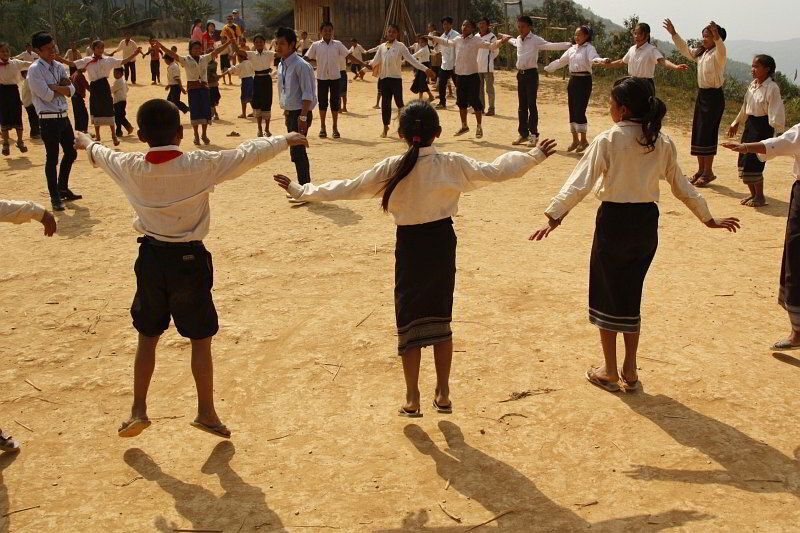 Games engage young minds and bodies. Just ask Daoheung, book party staff. At the end of the book party, every child receives a book of her or his very own! These girls are engrossed in their very first book, given to them by Big Brother Mouse, thanks to supporters like TAMMACHAT and many others from around the world.
" I can read!" And what a fun story! Peek inside our weaving books!